A royalty Celebration in the windows of Harrods. The royal wedding is only three days away. Not long to go before Kate & William say I do. 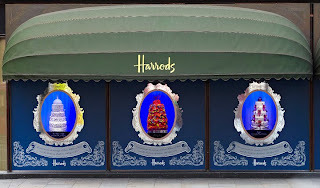 To celebrate the royal wedding in style, the famous department Harrods is to stage a unique confectionery showcase to mark the imminent marriage between Prince William Catherine Middleton. From Tuesday 26th until Saturday 30th April 2011, each of the store’s iconic Brompton Road windows will house one of the magnificent creations. The metre-high designs are each individually styled by esteemed designers fromthe worlds of fashion, fine jewellery, food and interiors, each specially invitedby Harrods to present their take other royal nuptials. The creations have been designed by Matthew Williamson, Jo Malone and Paul Smith who are amongst the other designers including: Clive Christian, Escada, Estee Lauder, Jo Malone, Laudree, Lalique,Missoni Home, Montblanc, Ormonde Jayne, Richard James, Temperly, Theo Fennell, Van Cleef & Arpels, and Wedgwood who were invited to create tiered wedding cakes for stunning celebratory exhibition in Harrods Windows. The Royal Wedding Cake window display will be displayed at Harrods will be housed in Brompton Road windows, from Tuesday 26th until Saturday 30th April 2011. The cakes will Housed within an ornate blue and sliver frame, incorporating HRH William’s coat of arms, the wedding cake will rotate throughout the day to display entirely of their designs for everyone to admire. This will be a real highlighter of the exhibition will be be an 18th cake, depicting Harrods iconic Knightsbridge store. The display will also include a collection of hertiage images of previous Royal Weddings. Each cake is property of the designer and will be returned after the exhibition is finished.